No restaurant should be without our promotional Restaurant Cocktail Stirrers on their bar, stunning and visually compelling to keep as a momento to take home, they are great for soft or regular alcoholic cocktail drinks and are familiar to swizzle sticks. Personalised with your brand name and logo of your establishment, ensure you give a free gift to customers and gain some valuable brand-name retention - next time your customers feel like a drink or refreshment. 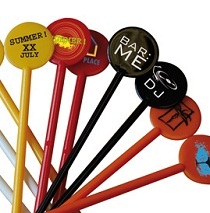 Stir up your advertising with a batch of customised Restaurant Cocktail Stirrers and you won't be sorry. For a FREE QUOTE, please fill in the form regarding our Restaurant Cocktail Stirrers and we'll be able to help you.